I'm living in NY now. I got a freelance gig for now...I think I swing by and get a REAL job by Sept! My boi is coming to NY too to live here!! And also find a job!! But he's moving in with me. I've only started dating him like a month ago. But we were friends before that. Before we hooked up we went to LA together and spent 2 weeks on the road, being in LA and livin it up! And then we got to gether in MPLS, I lived with him for 2 weeks when I didn't have an apt and we were really fine. No fights, we didn't get annoyed with each other, we laughed a lot and did a lot of things...hahahhaa. We tell each other everything. We talk the interwebz via chat everyday. And he cares about me a lot and I also care about him a lot. It's like, anything I do he supports and he doesn't care about anything that boyfriends would really care because he completely trusts me. I haven't had a real relationship in 3 years....Lolol not to mention I never really date azn guys. hahahahhaha. Am I crazy? I kind of feel like it's a crazy move. But like, it feels right. And I am happy. 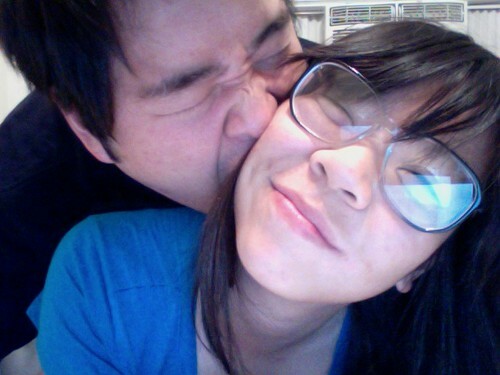 Besides, who doesn't like a cute azn couple? Lololol. It's a bit crazy. . . but it seems like you got something good. Hope it works out! Crazy, but nothing ventured, nothing gained!